Ramblings of a Deltiologist: Vivienne de Watteville 001: Female Adventurer! My research on Dorothy Pilley (see Pilley and Armstrong posts) has led me to pester postcard and ephemera stall holders for anything on female climbers from the 1920s. I have to say my queries are usually greeted with a lot of head scratching, but sometimes they dig out one or two things for me. I have been told that this is a difficult topic, so I am grateful when I find anything. Here is a signed photograph I got of another extraordinary woman and contemporary of Dorothy Pilley. Vivienne de Watteville was born in 1900. Vivienne de Watteville was not a climber as such, though I know she walked up a few mountains in Kenya in her time. Vivienne was an adventurer! She wrote two books on her adventures: Out in the Blue, 1927, and Speak to the Earth, 1937. Her first adventure described in "Out of the Blue" involved collecting things (animals and fauna) for the Museum of Bern in Kenya, Uganda and Belgian Congo. 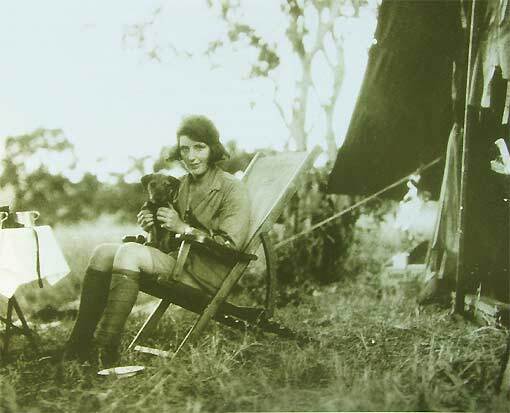 Even though it was filled with tragedy when her father was mauled to death by a lion, she soldiered on with the expedition, leading and completing it. Her second adventure recorded in "Speak to the Earth" was when she returned to Kenya to film and photograph animals. 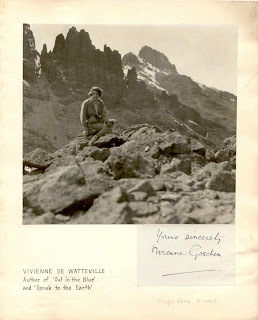 In July 1930 she married Captain George Gerard Goschen and moved to Surrey, which explains why she has signed the photograph Vivienne Goschen and why Kings Farm, Binsted is written on it. She died in 1957.